The Canton Curbside Recycling program accepts the majority of commonly-recycled items in general curbside pick-up. Four major categories of recyclable materials accepted under this program are: Paper, Plastic, Glass, and Aluminum/Bi-Metals. The materials listed on this page are intended to be used as a guide, and are not the only materials that can be accepted under the program. If you have question about specific materials, please e-mail us at recycle@cantonohio.gov. For a list of sample materials accepted under this program, see below. Canton Curbside Recycling will take nearly all forms of paper products under the current program. Paper should be dry, free from contaminants (i.e., food products, glue, plastic/foil coatings, etc. ), and separated from other materials in your recycling container (see "How It Works" for more information). Canton Curbside Recycling will only take #1 and #2-grade plastic containers. These are the most popular grades of plastic distributed today, so there's a good chance that most of the products you plan to recycle will be accepted by the program. You can find what grade of plastic your material is made from by looking at or near the bottom of the container. All other plastics are not accepted at this time. **Note: Plastic caps on plastic bottles are often made from a different grade of plastic that is not recyclable under our current program. Be sure to remove all plastic caps from bottles unless they are clearly marked as #1 or #2 plastic. This category of material is the easiest to recycle by all members of the family. 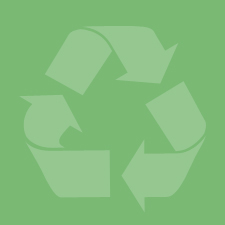 Canton Curbside recycling is currently taking all forms of aluminum and bi-metal (i.e., soup cans, pet food cans, etc.) products that have been lightly rinsed to remove all food products and/or other contaminants. Canton Curbside Recycling currently accepts all green, brown, and clear glass products. In order to avoid drawing bugs, animals, and other wildlife during the warm summer months, we strongly advise that you thoroughly rinse all glass products before placing them in your recycling container. Also, all broken glass products should be either placed inside another glass product (i.e., jar, bottle, etc.) or thrown into regular garbage cans.